Do you know what this is. Does anyone know what this is, i did not plant it... it has small leaves at bottom and larger at top. 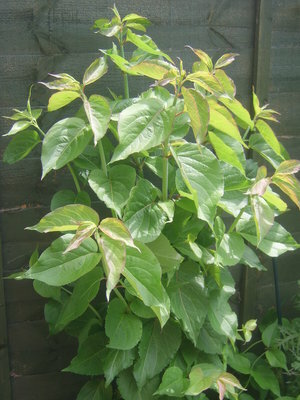 Looks very much like Leycesteria formosa - Himalayan honey suckle or Pheasant berry.Nice plant will drip with dark purple flower heads that develop into similar colour berries summer through autumn.Will grow to 6' plus with similar spread can be cut hard back in early spring to contain.Evergreen. Also stayed green here but coast protects from harsh frost which Andrew may get .Sorry you dont like Spritz probably too unruly for you suits my jungle though.